THE National Museum of Australia in Canberra says it's acquired one of the best-ever pelts of a Tasmanian Tiger – officially known as a thylacine – following its discovery just recently after nearly one-hundred years with a family of keen fauna collectors in New Zealand. And as a result of an extensive evaluation process, the Museum paid $250,000 for the pelt, half of that being a grant from the National Cultural Heritage Account. The Museum's Head Curator, Dr Martha Sear said the "extraordinary" specimen was considered one of the best-preserved thylacine pelts in existence, having been acquired by avid New Zealand collector, Archibald Robertson in 1923. It had been passed down to Mr Robertson's only daughter, Janet Withers upon his death in 1970, and came to the attention of experts in 2017 while on rare display in a New Zealand taxidermist and canoe hire business. Early European settlers in Tasmania hunted thylacines that attacked their livestock, and in 1888 the State Government paid a bounty of one-pound for every one of the stripe-backed Tasmanian Tigers that was caught. The introduction of hunting dogs by wild animal hunters and traders, coupled with the foreign diseases these dogs brought with them, resulted in large thylacine losses, with the last known Tasmanian Tiger dying in Hobart's Beaumaris Zoo on December 7 1936. The species was declared officially extinct by the Tasmanian government fifty years later, in 1986. The "extraordinarily good" Tasmanian Tiger pelt just acquired from New Zealand by the National Museum, will go on display at the Museum in Canberra in coming months, with a date yet to be announced. 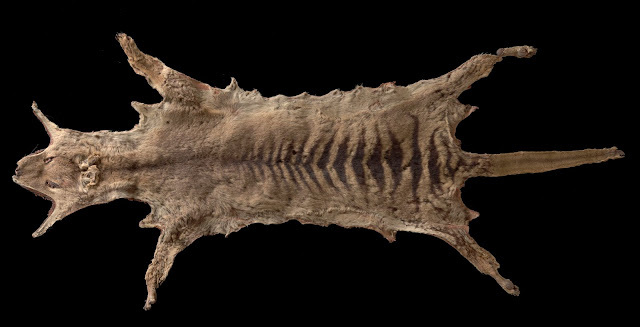 THIS "best ever" Tasmanian Tiger pelt has just been acquired by the National Museum of Australia in Canberra, after being discovered in New Zealand where it had been owned from 1923 by a family of avid fauna collectors.